Wrapping up nearly four years of commuting four hours a day. Tin Can Trust—Los Lobos. It’s been a very long time but Los Lobos—one of the greatest live bands in the world—has finally delivered a worthy followup to their 2002 gem Good Morning Aztlán. The fact is that the twenty years since their 1992 masterpiece Kiko has been pretty patchy. Colossal Head and This Time were hurt by uninspired songs and kitchen sink production. The Ride, an album containing duets with a number of other artists, was only partially successful. The Town And The City was better, but lacked a lot of the excitement and vigor that Los Lobos is more than capable of dishing out. But Tin Can Trust has it all. From the opening strum of acoustic guitar before it’s accompanied by a seemingly bottomless bass in “Burn It Down” the album leaps out of the speakers. It’s one of those rare albums that you know you’ll enjoy as soon as it starts. There are a couple of misfires: the jammy instrumental “Do The Murray” and the spacey “Jupiter Or The Moon” put a dent in your listening experience. Overall, though, these are exceptionally good songs. “Tin Can Trust” is a beautifully melancholy song about trying to make it in a bad economy, “All My Bridges Burning” features a great guitar solo and stunningly evocative vocal. Their version of “West L.A. Fadeaway” is yet more evidence that the Grateful Dead were better songwriters than performers. This version simply destroys the Dead’s original. Tin Can Trust also contains two extraordinary Spanish-language mariachi songs, proving that traditional Mexican music and rock ‘n’ roll can peacefully coexist when they’re played by a band that is this good. And at their best, Los Lobos is insanely good. Tin Can Trust falls a little short of albums like Kiko, The Neighborhood, and By The Light Of The Moon, but it’s still an extraordinary piece of work. Little Feat—Little Feat. The first album from California’s Little Feat is often overlooked even by fans of the band. That’s a shame, because it’s great. The second album, Sailin’ Shoes, had a little more weirdness to it, and a superior version of “Willin'” which makes its début on this album, so for most people it’s the second album that really begins the band because that was where their vision really started to take hold. But that’s not to say this album is devoid of that weirdness. Band leaders Lowell George and Roy Estrada were straight out of Zappa’s Mothers of Invention, one of the weirdest bands of all time. Just check out titles like the slide guitar workout “Snakes On Everything”, “Brides Of Jesus”, “Hamburger Midnight”, and the brief, irresistible album closer “Crazy Captain Gunboat Willie.” There’s also a failed cover of Howlin’ Wolf via Captain Beefheart in the rote blues “Forty Four Blues/How Many More Years.” Still, the Wolf cover is the only false note on the album. The album is blues, but it’s been run through the ringer and emerges as something skewed. It’s a band that’s close to achieving their own sound, but they’re not quite there yet. The difference is between the version of “Willin'” that appears here and the one that appears on the next album. In either version, it’s one of George’s best compositions. But while the Little Feat version is great, the Sailin’ Shoes version is the way the song is supposed to sound. Still, the album begins with two classic Feat songs (“Snakes On Everything” and the brilliant “Strawberry Flats”) and ends with a run of three songs that are as good as anything that came out of that California/Laurel Canyon scene (“Crack In Your Door”, “I’ve Been The One”, “Takin’ My Time”) before climaxing with the jaunty fun of “Crazy Captain Gunboat Willie.” Little Feat is very close to being a lost classic. Pezband—Pezband. Who? Yeah, good question. The surprise is not that there was once a band called Pezband. The surprise is that this, their début album from 1977, is so great. This is classic power pop. Hearing it in 2012 it’s almost impossible to remember a time when music like this was being pumped out of radios everywhere. As with most power pop bands they lack some of the power of the very best practitioners of the style, but they’ve got the pop down perfectly. The best power pop outfits (Badfinger, early Who, the Jam, Brendan Benson) combined the pop hooks and choruses of the Beatles with a thicker, heavier guitar sound. In so doing they created something different. It was reminiscent of the Beatles without sounding like the Beatles. It was harder-edged like the Rolling Stones, but more melodic. Pezband plays up the melodies and hooks while putting the heavy guitars into a background role, but unlike most of the second tier of power pop bands the heavy guitar does have a place. In fact, the final song “Close Your Eyes” ends with a wall of cascading drums and a truly ripping guitar solo. This was a band that could really play. This song, as well as “Baby It’s Cold Outside” and “When I’m Down” are power pop on a Badfinger level. The rest of the album isn’t quite up to that very high standard, but only “Tracer” and “Gas Grill” slide into a more generic level. The rest of the album is full of well-written, punchy, hook-filled wannabe hit singles. What’s surprising about Pezband is that they didn’t become as well-known as their fellow Chicago brethren, Cheap Trick. Certainly the songs were there. Collider—The Sam Roberts Band. Say this for Canadian troubadour Sam Roberts: He’s consistent. Unfortunately that’s what makes this album difficult to review. There’s a lot of this album that’s good: “The Last Crusade”, “Without A Map”, “No Arrows”, “Longitude”, “Twist The Knife”, “Partition Blues”, “Tractor Beam Blues” are all solid songs that sound like almost every other Sam Roberts song. Truthfully, if Collider was my first exposure to Roberts I would probably think more highly of it. Some of these songs are really very good. But this is Roberts’s fourth album, and the songs are all starting to sound alike by this point. “Without A Map” is good, catchy, well-played. But it’s hard to differentiate it from songs off We Were Born In A Flame, Chemical City, and Love At The End Of The World. It’s just another Sam Roberts mid-tempo song, high on craftsmanship, low on inspiration. To be fair, there are only two clunkers on the album. The turgid “I Feel You” and the languid “The Band Vs. The World.” However, there are also moments when the craft of songwriting meets inspiration, “Let It In”, “Graveyard Shift”, “Streets Of Heaven (Promises, Promises)” and “Sang Froid” are all Sam Roberts at his best. Collider is a Sam Roberts album. This is what he does. As with the others, it’s almost start-to-finish enjoyable. But if you’ve heard Roberts before, you’re hearing him now. Oceania—Smashing Pumpkins. It’s been a long time since I was looking forward to a Smashing Pumpkins record. Bill Clinton was President. After the departure of drummer Jimmy Chamberlain following Mellon Collie And The Infinite Sadness, Billy Corgan seemed like a man who didn’t know where to go next. The band continued to release some great songs, but no great albums, until they broke up in 2000. Corgan followed the band with Zwan (whose one album is unfairly forgotten) and a solo album that was heavy on synthesizer noodling. Responding to pressure from fans, he reunited with Chamberlain and released Zeitgeist in 2007. It was a monstrously loud, riff heavy noisefest, and it wasn’t too difficult to figure out that Corgan was giving those fans who wanted him to rock out again an overdose of what they wanted. But in the last few years, again without Chamberlain, Corgan’s been releasing free downloads of a project called Teargarden By Kaleidyscope, and the songs have been excellent. When he announced the release of Oceania, it appeared that he’d made peace with the legacy of the Pumpkins, and was once again ready to put out work of a high quality. So close…yet so far away. Fortunately, Corgan picks it up again. “The Chimera” returns to heavy guitar rocking again with a catchy chorus. Musically it probably has more in common with Zwan than with the prime Pumpkins, but that’s okay. It’s one of the best tracks on the album. It’s followed by two more excellent songs, the sliding and gliding “Glissandra” and the hard groove “Inkless”, before limping to a conclusion with “Wildflower”, a nearly-five minute tone poem that would have been a good two-minute album closer, but is rendered almost unlistenable by its length. Better luck next time, Billy. Even If And Especially When—Screaming Trees. Opening with the terrific garage blast of “Transfiguration” the second full-length album from Seattle’s Screaming Trees is a continuation of the sound the band had forged, but the more overt psychedelic touches have been toned down and the guitars turned up. What comes through—sporadically, to be sure—is an early version of what would later be called grunge. “Straight Out To Any Place” could have fit nicely on the radio in the wake of the alternative rock explosion of 1992, and their first truly great song “Pathway” would not have sounded out of place on later Trees albums like Sweet Oblivion and Dust. What mars this album is that the band were still learning to write. Despite several gems, most of Even If And Especially When is standard issue garage rock. Quite good and fun to listen to, but not memorable in a way that later Trees songs would be. At this point, the Trees were still a band with great potential, but only good execution. It’s an improvement over their first album Clairvoyance, with songs like “Transfiguration”, “Straight Out To Any Place”, “Girl Behind The Mask”, “Cold Rain”, “Pathway”, and “Back Together” rising to the top. That puts half of this album solidly in the very good to great range. Of the other songs only “In The Forest” misfires. The others are simply decent album tracks that are quickly forgotten when the album ends. Throw It To The Universe—The Soundtrack Of Our Lives. And so, the best musical export from Sweden comes to its end. This is the last album by TSOOL, and it’s an odd one to go out on. What’s missing here is the pulverizing hard rock of which the band is capable. This is a laid back, groove-oriented album, heavy on lyrical reminiscences and fond farewells. The title track opens the album with both an introduction and a goodbye: “We say hello to say goodbye/We are the soundtrack of your life” sings frontman Ebbot Lundberg over a musical track that starts with a strummed acoustic guitar and builds to a solid rock climax. It’s one of the few outright rockers on the album, sharing it’s slow build properties with their previous album’s opener, “Babel On.” The second song, “You Are The Beginning”, is a lush, beautiful ballad. Most of the rest of the album splits the difference between these opening songs. There’s a heavy acoustic presence on the songs, and the majority of tracks ride a mid-tempo groove. This could get boring, but the album sensibly hovers just above the 45-minute mark. With 13 songs, nothing overstays its welcome, and the musical interplay between these guys is so good it makes each song a pleasure to hear. Even on the slower tracks there’s enough going on musically to keep things interesting. The lyrics are some of the best they’ve written, with nearly every song addressing the end of the band in some way: “we’re about to dissolve into oblivion”, “need to start again”, “the turning of the final race is here…now we’re back to be gone”. “Shine on/there’s another day after tomorrow/there’s another day after the end” sings Lundberg as TSOOL concludes their final album. This isn’t their best album, but it’s a fitting end. Secret Treaties—Blue Öyster Cult. Forget the admittedly funny Saturday Night Live skit with Christopher Walken recommending ever-increasing amounts of cowbell be added to BÖC’s classic rock staple “(Don’t Fear) The Reaper.” It was an odd skit coming about 30 years or so after the last Cult fan graduated high school. But then, BÖC was an odd band. For a period in the early to mid-Seventies, they were the bizarro cousins of Black Sabbath, relying more on science fiction than horror motifs. They were intelligent where Sabbath wasn’t, and while the Sabs relied on molten slabs of granite riffs, BÖC relied more on speed and the jack-rabbit runs of guitarist Buck Dharma (Donald Roeser). They were dubbed “heavy metal” but they were really more of a psychedelic-tinged hard rock band. Secret Treaties, released in 1974, should put the lie to the notion that BÖC was heavy metal. Sure there are plenty of hard riffs, but the songs are far more melodic than most metal, and the music relies more on interplay than on crushing guitar. Lyrically they keep an eye on the dark side without resorting to the cartoonish doom and gloom of Sabbath. The topics here include the closing days of World War II (“ME 262”), drug experimentation with horrific side effects (“Flaming Telepaths”), what appears to be a song about interplanetary conflict (“Astronomy”), and one whose lyric was inspired by former Supreme Court Justice Abe Fortas (“Harvester Of Eyes”). Even the loaded title “Dominance and Submission” is not about what you think: it’s about New Year’s Eve in 1963 being the dividing line between the old and new music (“In Times Square people do the polka/Dominance…Submission…Radios appear/This New Year’s Eve was the final barrier”). Most of it’s pretty nonsensical, but just go with it. The melodies are great, the words are fun even if you don’t know what they’re about, and BÖC was a band that understood intricacy in their playing. This is a very good album. Of all the Beatles’s classic albums, it is probably Help! that gets the short end of the stick. This is due to a couple of different factors: 1) it was quickly overshadowed by Rubber Soul, 2) the movie was not as good as A Hard Day’s Night, 3) the American version of the album was cluttered with movie theme music and left off many of the best songs. It wasn’t until the CD era, in 1987, when Help! was released in America the way the Beatles intended, and the result is a revelation. Help! is the first full-throated embrace of Bob Dylan and, to a lesser extent, the Byrds. This is the clear warm up to Rubber Soul. It bids a final goodbye to the happy little rockers the Beatles had been and definitively steps towards what the Beatles would become. 13. The Chase (Instrumental) 1. Help! I will confess a weakness for one aspect of the US edition over the UK edition. I grew up listening to the brief snippet of the James Bond theme leading into “Help!” and that part of the listening experience is hardwired into my DNA. Otherwise, there’s simply no contest here and it is clear why Help! wasn’t recognized in America as being the great album it is. Incidentally, the two versions of the album had remarkably different packaging. The UK edition was packaged as an album, the US edition as a soundtrack complete with lots of photos from the movie and no small amount of marketing hype about the film. Also, the order in which the Beatles are standing on the front cover is different for some bizarre reason. The first seven songs are the new Beatles songs from the film, and are as good or better than almost anything the Beatles had done to this point. The title track, written as a ballad by John Lennon, is given an air of desperation by the sped up arrangement. Deceptively toe-tapping good-time music underpins a lyric that is every bit as harrowing as any of Lennon’s later primal scream epics on John Lennon/Plastic Ono Band. Trapped by the confines of Beatlemania, Lennon turned his pen inward and wrote a lyric dripping with pathos. Lennon had done this before with songs like “I’m A Loser” from Beatles For Sale, but he had blurred his tortured emotions in the guise of a love song. With “Help!” it was all out in the open, a cry in the wilderness of Beatlemania. It’s easy to forget that Lennon was only 24 years old at this time and one of the four most famous people in the world, and the demands of band mates and fans must have been nearly unbearable for the fiercely independent songwriter. 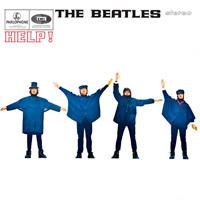 “Help!” is the first of John’s truly mature songs and one of the finest arrangements the Beatles had produced. Listen to the backing vocals, actually preceding the lead vocal, and the way they are sung. Lennon sings the lead quickly, full of vigor. The lead vocal does not sound like a man on the edge of a nervous breakdown. But the backing vocals are sung more slowly, in fragments of lyrics. It’s almost as if the backing vocals represent the sadness and insecurity Lennon felt, while the lead vocals are the full howl of pain that finally burst forth. I don’t know how much of this is intentional, but listening to the vocals on “Help!” is like being privy to both the private interior monologue and the desperate public cry of a man whose soul is roiling with emotional torment. The effect, especially when coupled with the ringing Byrds-like guitars, set a new standard for Beatle songs. Anything after that opening is bound to be a let down in some ways. But it’s only in comparison to the title track that the other songs suffer. “The Night Before” and “Another Girl” are standard issue Paul McCartney songs: lyrics about love (lost and found, respectively), great melodies, etc. They become great Beatle tracks because of the arrangements. From Lennon’s organ to McCartney’s bass stepping gingerly throughout the song, the stinging lead guitar (also by Paul), and the call-and-response vocals, “The Night Before” is triumphant. Similarly, “Another Girl”, the happiest-sounding kiss off to a girl ever recorded, is nothing really special until the absolutely irresistable hook rises out of the chorus. George’s contribution to the soundtrack portion of the album is his best song thus far. “I Need You” (by George Harrisonthat’s a joke fans of the film will get) rides a simple two chord guitar riff manipulated by a volume pedal and the best use of a cowbell prior to “(Don’t Fear) The Reaper”. Lyrically it’s nothing special, but it’s the first time George was able to craft a melody that could stand along those produced by Lennon and McCartney. For the first time, a George-penned track didn’t sound like a throwaway or an afterthought. It sounded like the work of a rapidly maturing songwriter. The rest of the film songs belong to Lennon. They’re not as nakedly emotional as the title track (though the gorgeous “You’ve Got To Hide Your Love Away” comes very, very close), but the words mostly reflect Lennon’s state of mind during this time, what he called his “fat Elvis” period. “You’re Going To Lose That Girl”, with Ringo’s stunning bongo work, is the darker flip side of “She Loves You.” While the earlier track and its ebullient “Yeah yeah yeah” hook are a reassurance of a woman’s love, “You’re Going To Lose That Girl” warns that if the loved one does not act quickly, the lover will be stolen…by the same guy who was shouting “Yeah yeah yeah”, no less. The “yeah yeahs” are here replaced by a more sinister-sounding “Yes yes.” The one instance where the word “Yeah” pops up is as a snarl after the line “I’ll make a point of taking her away from you.” It’s a deceptively dark song that, like “Help!” is married to a joyful racket. The title of “You’ve Got To Hide Your Love Away” could refer to the fact that Lennon was under strict orders to keep his marriage to Cynthia a secret, lest it should break the hearts of teen girls across the globe, but the lyric is a very straightforward lament for lost love. What matters here, is the spare acoustic instrumentation and the “feeling two-foot small” lyric. Although the lyric was just a flubbed line, Lennon left it in because he preferred it to the actual “two feet tall”. Both the instrumentation and the surrealism of that lyric (and the “gather round all you clowns” line) are direct imitations of Bob Dylan. The Beatle music in this song comes at the end, in the form of a flute solo played by British composer John Scott. Again, it shows the Beatles thinking outside of the traditional rock box. Throughout the album, Dylan’s influence is very strong. This is the most acoustic album the Beatles had done. Acoustic guitars are prominent in the rhythm tracks, even as Dylan (influenced by the Beatles) was plugging in for the first time. As such, this is also the most different Beatles album yet. Dylan’s influence had reared its head earlier on songs like “I’m A Loser”, but there the Beatles appeared to be copying the Bard of Greenwich Village. Here, for the first time, it sounds like the Beatles have fully absorbed the sound and run it through the filter of their own budding genius. “Ticket To Ride”, described (incorrectly) by Lennon as “the first heavy metal record”, is the last of the film songs. The chiming guitar riff does sound like the Who as played by the Byrds, and Ringo plays the hell out of the drums. (You think Ringo’s not a great drummer? You’re an idiot. Shut up and listen to this.) Paul’s bass is straightforwardly simple, probably because this was the first song where Paul handled not just a solo but lead guitar, leaving George and John to handle the rhythm. Heavy metal it isn’t, but it’s one of the heaviest songs the Beatles ever did. The non-film songs that make up side two of the record are a little more problematic. “Act Naturally”, a country hit for Buck Owens, was given to Ringo to sing as a nod to his surprisingly good performance in the Hard Day’s Night movie. As with most of the songs given to Ringo, it’s fun and fairly lightweight. As four young men from Liverpool, the Beatles were far from country music. They play the notes well enough, but it never sounds like anything more than a lark. Lennon’s “It’s Only Love” returns to acoustic rhythms with a loose lead. The lyrics are nothing special, but the vocal sells it, especially John’s falsetto swoop at the end. This song ended up as the first song on side two of the American version of Rubber Soul, and it fit better on that album. Here, sandwiched between the faux country of “Act Naturally” and the unremarkable George-penned “You Like Me Too Much”, the song sounds out-of-place. The same fate falls on Paul’s considerably better “I’ve Just Seen A Face”. The propulsive, yet folky, song was the first song on the American Rubber Soul and set the tone for that album. Here, in its original (and, I suppose, proper) place, it’s between the nothingburger “Tell Me What You See” and the masterpiece “Yesterday.” The placement of this song on Help! makes one of McCartney’s best songs lose the impact it had on American audiences when it kicked open the door to Rubber Soul. Still, it’s brilliant. It’s a new standard in 1965, and recognized as such immediately. There was no need for “Yesterday” to stand up to the rigors of time. It was clear the first moment the needle hit the groove that McCartney was writing for the ages on this one. People who loved rock and roll accepted it as a great ballad. People who hated rock and roll fully embraced it. The kids loved it and so did Mom and Dad, ensuring that the Beatles could appeal across generational boundaries. More than any one song, “Yesterday” buried the image of the Beatles as the Mop Tops. This was a serious song, with a serious arrangement. To really appreciate the greatness of the song, the version on Anthology 2, before the string section had been added, makes the song sound fresh again. This version presents the song as McCartney wrote it, with just his guitar and vocals. For this listener, this alternate take is the best version of the song. “Yesterday” was so masterful and so different that including a souped-up cover of “Dizzy Miss Lizzy” sounds wildly out-of-place. It’s a great versionprobably the definitive version of this songbut it’s obviously a place-filler for a band that needed to release an album but didn’t have quite enough songs ready to go. Following all the acoustic introspection that preceded it, the effect of the slashing guitars and wailing vocal from John is, to say the least, jarring. It’s a great performance. It also is what it is: a by-the-numbers cover of a song by a writer who, at his best, was nowhere near the level of Lennon and McCartney. Help! deserved a better ending than a song that would have sounded redundant on With The Beatles. Help! pointed in the direction the Beatles were going. The best was still ahead.